We offer Cresyl Diphenyl Phosphate that are very useful for industrial usage. C.D.P. (Cresyl Diphenyl Phosphate ) is a low viscosity synthetic phosphate esters. Speciality Chemicals C.D.P. find uses in wide variety of applications as flame retardant plasticizers. Ethyl cellulose & cellulose acetate butyrate. 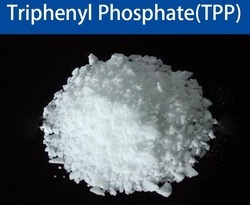 Triphenyl Phosphate is used principally as a non-solvent plasticizer for cellulose acetate films having up to 80% retentivity and giving flexibility and toughness to the films. An excellent catalyst/inhibitor/chain terminator for the growing polymer chain for the manufacture of polyester fibre. An excellent flame retardant and plasticizer for synthetic resins viz. Phenol formal-dehyde, decorative laminated sheets etc. It is also used in making stencil blanks, dopes films, varnishes, enamels, plastics, lacquers and for impregnating roofing paper.